Achieving clear as crystal gardening water is one of the biggest challenges in water gardening. But, it should be said, that gardening water that is actually crystal clear probably has chemical or mineral pollutants in it. Ideally the water should be slightly brown or green. When you first fill your pond with a hose the water will not be suitable but by allowing the crystal gardening water that comes from your tap to stand for a few days will let most of the chlorine dissipate. But you will also need chemicals to treat chlorine dioxide and chloramines. Pond supply dealers, garden suppliers and pet stores have kits you can use to test your crystal gardening water for unwanted substances. The dealers in those stores can advise you on treatment. Do not, however, use chemicals unless it is absolutely necessary. Do not put your plants and fish into crystal clear gardening water until after you have removed the chloramines. Once you are rid of the unwanted substances, introduce the plants. They will begin the job of producing the food and oxygen that fish and other aquatic animals will need. They will also prevent the build-up of algae. The water will turn green, but it will clear up in a few weeks as the plants establish themselves. Then you will have the almost clear as crystal gardening water that is the best habitat for your plants and fish. Now you can introduce fish, snails, and whatever other pond dwellers you wish. 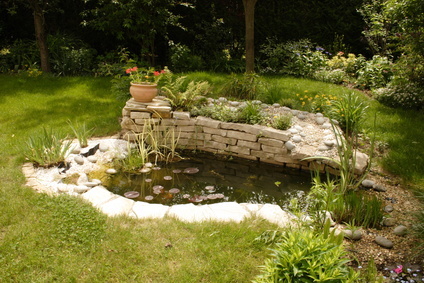 It is natural for your water garden to have some algae in it. The mossy algae that grow on the side of the pond are actually beneficial, as they remove toxins from the water. But algae must not be allowed to grow unchecked. If they do, they will starve submerged plants by depriving them of nutrients. This in turn will deprive fish and other aquatic animals of oxygen, and they will die. Algae growth also makes your pond look unattractive. You can control the growth of algae by putting in water lilies and other floating plants. They consume the nutrients that algae live on, and block out the sunlight algae require for growth. Snails and some fish help by eating algae. If at all possible, keep algae growth under control by those natural means. You can also skim algae off the surface with a fine mesh net, a brush or a rake. It can also help to install one or two filters. If you must use chemicals, remember that is only a temporary solution, and one that could be harmful to your plants and fish.